This week, visitors to Dog Bark Park and the agricultural prairie around Cottonwood, Idaho will see miles & miles of grain fields being harvested. 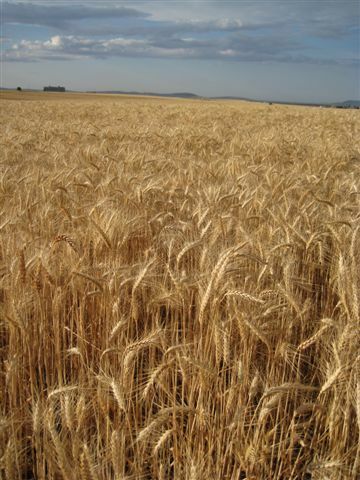 The major crop is wheat, although canola and barley is also grown and being harvested now as well. Soft white wheat is the variety grown here which is the type of wheat predominantly used in making noodles and pastry flour. Most of the grain is trucked to Idaho’s seaport at Lewiston where it is barged down the Columbia River for export to the orient. Dryland farming is the method of agriculture here. Moisture received in the spring and fall is adequately held in a thick layer of clay just beneath the rich layer of volcanic topsoil. Beneath the clay is basalt bedrock which keeps the moisture in the clay layer that roots of the grain plants can readily reach. Several gigantic combines will ply large acreage fields in a staggered formation making artful patterns in the stubble as they manuever their way across the huge fields. The dust surrounding the combines is the chaff being expelled at the rear of the machine while the wheat kernels are collected in giant hoppers on the combine. When the combine hopper becomes full even larger tractor-pulled hoppers saddle up next to the moving combine which will extend its discharge chute over the receiving hopper to expell the grain. All this is done while the equipment continues to move; rather like refueling jet planes in the sky. During the dry season, typically from July through September, bare ground will develop large cracks due to the presence of so much clay in the soil. This photo is a low spot at the edge of the wheat field where the wheat did not grow due to prolonged wetness this past spring. The cracks are about one-half to one inch wide & extend several inches deep.